Myles Powell (13) nearly led the Pirates to victory. @SetonHallMBB. The Seton Hall Pirates' season came to an end on Thursday night in Jacksonville, as they lost their NCAA Tournament first-round matchup to Wofford, 84-68. Wofford led this one 40-30 at halftime, but Myles Powell brought Seton Hall all the way back in the second half when he reeled off 12 straight points to give them a 54-53 lead with 10:51 remaining. The lead seesawed, and Wofford opened up a five-point edge before Powell drained a three and then, after he was fouled on a shot after a steak, made a free throw to cut it to a one-point game, 67-66, with 4:37 left. 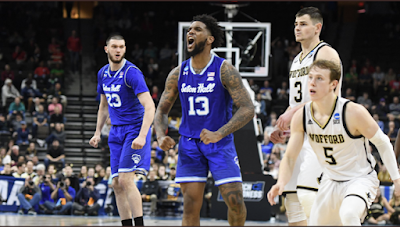 Wofford then reeled off a 17-0 run to seal the game before Romaro Gill made a dunk with 27 seconds left to break Seton Hall's scoreless streak. Powell led Seton Hall with 27 points on 10-25 shooting, including 4-11 on three-pointers, with 3 rebounds and 3 assists. He was the only Pirate to score in double-figures. Jared Rhoden had a nice game, with 9 points (3-8 FG, 2-4 threes) with 5 rebounds and an assist, off the bench. Sandro Mamukaleshvii had 8 points (3-6 FG, 1-2 threes), 7 rebounds, and 2 assists. Quincy McKnight had 6 points (2-7 FG), 8 rebounds, and 3 assists. Wofford was led by Fletcher Magee, who had 24 points on 7-14 shooting, including 7-12 from behind the arc, meaning all his baskets were three-pointers. Nathan Hoover had 18 points (5-11 FG, 4-7 threes), with 4 rebounds and an assist. Cameron Jackson had 14 points (5-8 FG) and 10 rebounds to give him a double-double, along with 5 assists. Storm Murphy had 11 points (5-10 FG, 1-4 threes), with 5 rebounds and 3 assists. Q. Kevin, I know you've talked all year long about how proud you are of these young men, and I know that doesn't change. What do you think went wrong tonight, but also what will you take away from this year when the disappointment finally ebbs a little bit? KEVIN WILLARD: I just think that's a heck of a basketball team we played. When you have a senior-laden team like they do, who's extremely well-coached, you're going to have to play really good to beat them. And we just turned the ball over in the first half. That really kind of put us behind the 8-ball and gave them too many opportunities. But these guys have left it on the floor all year long. I love the way they've battled. Couldn't be more proud of the season we've had, and couldn't be more proud of them as individuals. It's always tough to lose, but that was a good basketball team that played really well. Q. Mike, I saw you the start of the second half, you sort of commanded the huddle there. This was obviously your last game. What's the emotions going through your mind right now? MICHAEL NZEI: I mean, I never wanted this to come to an end, but you always make plans, and sometimes it doesn't happen. But I'm just thankful for my teammates for fighting with me throughout this journey and like sticking by my side. I feel like we came out today, we gave all we could, and it didn't go our way, but we've just got to keep our head up. There's always more road on this journey. So I'm really happy for these guys. I know they'll have a bright future, and I can't wait to see what they're all going to achieve. Q. Myles, what will you take from Mike, playing with him for three years and just learning from him, the player he is on the court and the person he is off the court? What are you going to take away from that? MYLES POWELL: Mike is a great guy. Our journey goes on past just these three years. When Mike came over here, we played AAU together for New Jersey players. This is my blood brother right here, we're not just teammates. We're still going to talk. He's still going to help me lead this team from afar. Just because he's not here, I know the person Mike is. He's still going to be with us. When you let a guy like this go, it hurts, but like I said, I know Mike is still going to be with us. Q. Mike, what do you think of this team, this group's potential next year? And what kind of legacy do you want to leave them with? MICHAEL NZEI: I mean, we could start from the point of expectations people had for this team. Everyone thought it was a group of young guys, but these young guys showed they got heart and they showed they could fight. I look at them and I know the ceiling is so high, and I feel like this year for them is just a building and a learning year, and as time goes for next year, I believe a lot of the potential is going to come out fully, and I feel like from this point you're going to see a team of mature guys, and I believe they're going to keep fighting as time goes on and they're developing. Q. Myles, this game was pretty similar individually for you in a lot of ways, slow first half and then you come alive in the second half. When you got going in the second half, does it feel a little like déjà vu, kind of the way you've been willing the team in the past couple games, that this was going to be the start of it again when you guys took the lead there? MYLES POWELL: I mean, we've been in this situation all year, backs been against the wall. Our coaching staff did a great job just telling me to relax and telling me that the game was going to come to me. My teammates had my back, my coaching staff had my back, and it's been like this all year. So when you have a group of guys like that, that's always picking you up, it's kind of hard to lack confidence. I love this group. Q. Myles, just to continue with that, how hard did Wofford make it on you? You've seen it all year, but how much did they make you work for what you had tonight? MYLES POWELL: Like you said, I've been seeing this all year, but they did a good job. They're well-coached over there. They have a group of seniors. They know what they wanted to do. It seemed like every time I drove the ball they were collapsing or if I was coming off pick-and-rolls they was double-teaming. They made it hard for me tonight, and yeah. Q. Kevin, what can your underclassmen learn from this? KEVIN WILLARD: Yeah, I mean, the biggest thing is what I just talked to them about was seeding. Seeding really matters. You know, when I watched them on film, I knew this was probably going to be the best team we played all year, to be honest with you, just because they were so balanced inside and out, they run good stuff, they're much better defensively than they look. So I think the biggest thing going forward is we've got to make sure we don't hurt ourselves and take advantage of opportunities, and try to get better seeding because after three -- the last three weeks has been an emotional roller coaster, knowing that we've had to win games, playing three tough, hard-nosed games in the Big East Tournament. You get a 10 seed, you're going to play against a really, really good team, and that's a really good team. Q. Defensively how much of that was Wofford being great, how much of it was something you would have liked to have seen you guys do differently on the perimeter? KEVIN WILLARD: I mean, they're going to make shots. They just are. My biggest fear came true, was that Jackson was going to take over the game, and I thought the biggest difference in the game was obviously, A, we turned the ball over. But B, early in the game, he settled them down. He got them going, and that was my biggest fear going into this game was that he's a guy that doesn't get talked a whole lot about, but he's a guy, you look at the plus/minus, and he was plus 27. He kind of got them going and made some big buckets, got an and-one, and I really thought he was the difference in the game, believe it or not. They made some threes during their run, but we were shot. But he was the difference in the first half, and I thought he was really a difference in the game. Q. Kevin, you said before we got here that you thought the country knew about Myles, but you expected them to get a bigger taste of it when we got here. Seeing what he did in the second half, about what he's done the past couple weeks, I guess, how impressed are you just in big moments with what he's been able to do? KEVIN WILLARD: Yeah, again, I think I've said this a thousand times. I'm not that impressed at all, to be honest with you because I've seen it so much. It's the way he plays in practice, it's the way he works in individual instruction. I thought he took a huge jump this year in his game from a standpoint of being a main guy. But nothing that he does out there ever kind of -- I sit there and go, oh, geez. It's what he does all the time. I guess that's my answer.